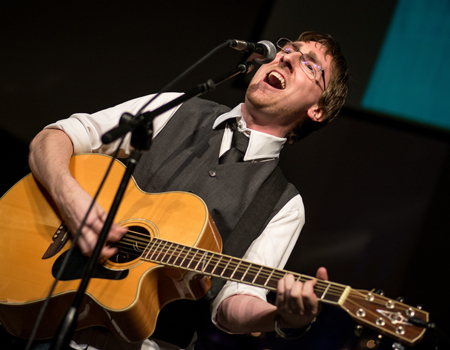 Award-winning recording artist Daniel Christian (Tremulant Records) shares his songs and stories in concert at arts council events, festivals, fairs, theaters, churches and listening rooms across the nation. He has entertained audiences at Bluebird Cafe (Nashville), Eddie's Attic (Atlanta), Country Stampede (Manhattan KS), SXSW festival (Austin) and even cruise ships and Disney theme parks. Daniel has opened shows for a diverse range of popular artists from The Fixx to Montgomery Gentry, and recently completed a coast-to-coast tour of the United States. Completely at home in front of diverse audiences, Daniel’s humor, openness and spontaneity engage every crowd in a memorable experience they'll tell all their friends about! Critics and fans agree that Daniel's thoughtful music "sounds like cinnamon rolls taste"! Daniel Christian was born to make music. His passion, creativity, artistry and humor break down the distinction between audience and performer. By the end of the evening, his audience is singing along with the same joy that fills Daniel. Daniel Christian leaves his audience wanting more of his thought-provoking lyrics and his effortless guitar and piano. Daniel Christian is a talented musician who we can always count on to provide a high-quality performance. His stories entertain us and make us laugh. We always look forward to having Daniel back on campus! An outstanding musician with a knack for putting an audience at ease. His laid-back style and friendly personality make Daniel a delight to work with and a joy to watch on stage. We can’t wait to have him back again! Daniel Christian is an exceptional Nebraska musician. He engages and captivates our audiences, singing the classics and his original music with absolute ease and passion. He offers a wide variety of genres, all blended into a perfect musical smoothie. A true treat for the ears and soul! A delightful evening of music and fascinating stories. An inspiring, uplifting and entertaining concert by a very talented artist! Technical requirements: Artist provides PA system for solo performances, which fits most stage areas. There should be a power source on or near the stage area. Artist does not bring lighting for acoustic shows, but has no specific requirements. Full band productions will require a stage area at least 15' x 25' and sufficient sources of power—at least six separate 20-amp circuits (or one 60-amp 220 plug)—and sufficient electrical extension cords to provide power to the stage area. Outdoor events should include protection from extreme temperatures, direct sun/wind, storms, etc.